Groups > Persecuted Christians > Discussions > Topic: PETITION FREE PASTOR! My name is Vera. I am 8 years old. I live in Uzbekistan. I have a Dad, a Mum, and two older sisters. We all believe in Jesus. My Dad is a pastor. Two years ago he was put in prison, because he spoke to people about God. I don't understand why. My Dad is the best of all! He is good, fun-loving and generous. I really miss him. He used to take me to the park and bought me ice-cream. We all long for him to be here. Mum often cries and worries about him. When I wake up each morning I really want to see Dad. I ask God to bring Dad back to us. So that everything will be as it was before. Help us to get my Dad back! 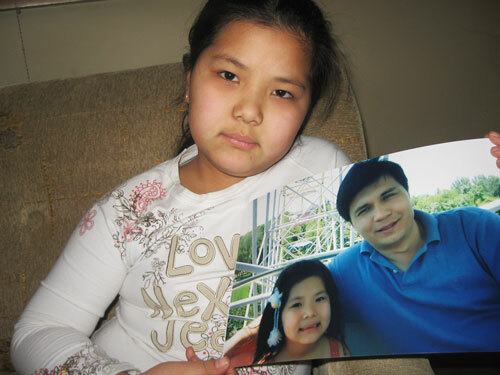 On January 21, 2007, Pastor Dmitry Shestakov was arrested in a raid on his Full Gospel Church in Andijan, Uzbekistan. Uzbekistan's Religious Affairs Committee claims Shestakov, an evangelical pastor affiliated with the registered Full Gospel Church, is not an authorized leader of any officially-recognized religious organization in Uzbekistan. They describe him as an "imposter" leading an underground group engaged in proselytizing under Shestakov's leadership. He is appealing his four-year labor camp sentence. ICC is joining a broad effort to send letters to Uzbekistan on behalf of Pastor Shestakov for the month of April, in conjunction with the website www.freepastordmitry.com. Would you join us, and help Vera see her father again? #2 Next, review our petition. Uzbekistan officials are concerned about their relationship with the United States and other countries, so when the people shout, they will listen. We have also found that evil prefers to stay hidden and when we shine the light on it, it flees. Please get them back to us by April 22.